Lens Description: The Schneider 80mm f/4.5 Super-Symmar XL Lens is a professional wide angle lens for the 4x5 format, which provides an angle of view on 4x5 which is similar to a 21mm lens in the 35mm format. 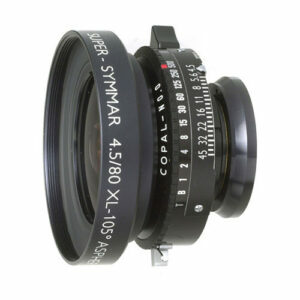 The Super-Symmar XL lenses are the world\'s first aspherical lens design for large format, producing incredible peak sharpness with excellent correction for distortion and a small overall size. The 80mm f/4.5\'s large image circle allows plenty of creative control for the photographer-in fact, it has the largest image circle of any 80mm large format lens. Beyond the coverage, the lens\' large f/4.5 maximum aperture helps to ease the difficulty of focusing the camera in poor light.rnrnThe 80mm Super-Symmar XL\'s 105° angle of coverage permits a generous 34mm of all-direction shift on the 4x5 format, which is particularly beneficial when capturing a building from ground level. It can be mounted upon any view or field camera, thanks to its tiny 43mm diameter rear barrel which only extends 14.8mm behind the mount, allowing plenty of space between the rear of the barrel and the image plane for tilts and swings.